WITHINGTON Golf Club were fine hosts for the Manchester Alliance 18 Hole Strokeplay Championship with sunny weather and a strong breeze testing out some of the region’s top players on a firm course in excellent condition. The Scratch competition title has eluded him after many attempts but he gained inspiration from his 8-iron tee shot on the 159-yard eighth hole which went unerringly into the hole for the seventh ace of his distinguished career. His most memorable previous ace was at San Lorenzo in The Algarve on the fifth hole during the annual Knutsford v Hale Ryder Cup match that cost him a lot of drinks at the 19th. 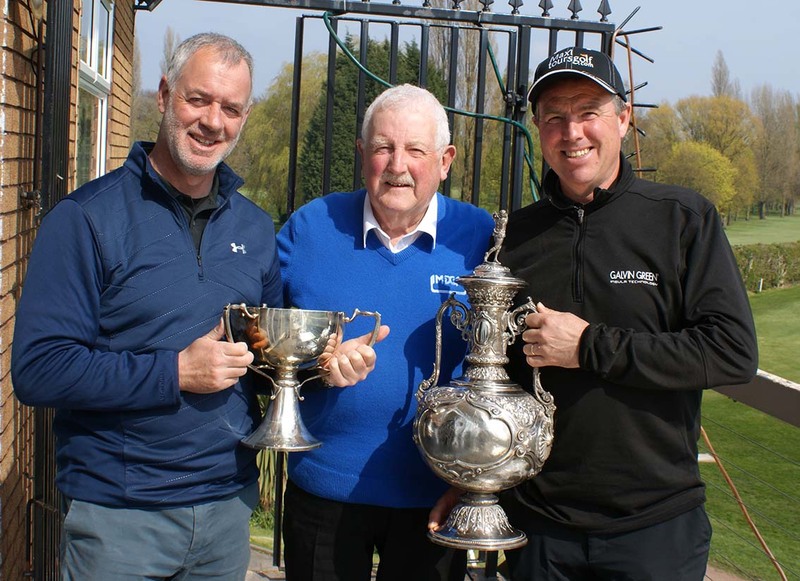 His delighted playing partners at Withington were Chorley professional Mark Bradley and his assistant pro Andy Palmer who were able to share the usual celebrations with Tim after the golf. After his ace Tim went on to post the top score of 68 to see off the challenge from Ollie Smith (Ashton-on-Mersey) 69, Andy Palmer 70 and Alliance OoM leader Phil Archer (Poulton Park) 72. Ashton-on-Mersey amateur star Mark Davin looked to have successfully defended the trophy he won last year for the top amateur as he led for a long time with 78 but as so often happens there was a sting in the tail as last man in Martin Keates, the ex Captain of Withington, came in at the death to post 77 to take top spot and another historic Alliance trophy. Pics – 1 Tim Maxwell ready to celebrate his ace with Left Mark Bradley and right Andy Palmer, 2 Winners presented with their trophies by Alliance Vice President Ian Brooks (Bolton Old Links).